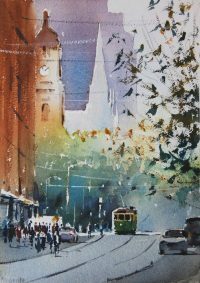 Malcolm is renowned Nationally and Internationally for his watercolours that capture the essence of time and place and is an excellent teacher. Due to increased tutor charges (by all artists) and travel expenses etc. the costs for this workshop will need to rise a little bit and requires a minimum number of 10 to proceed. We need 10 to 12 participants. I have canvased some of AWAS members and they are more than OK with the proposed workshop costs. 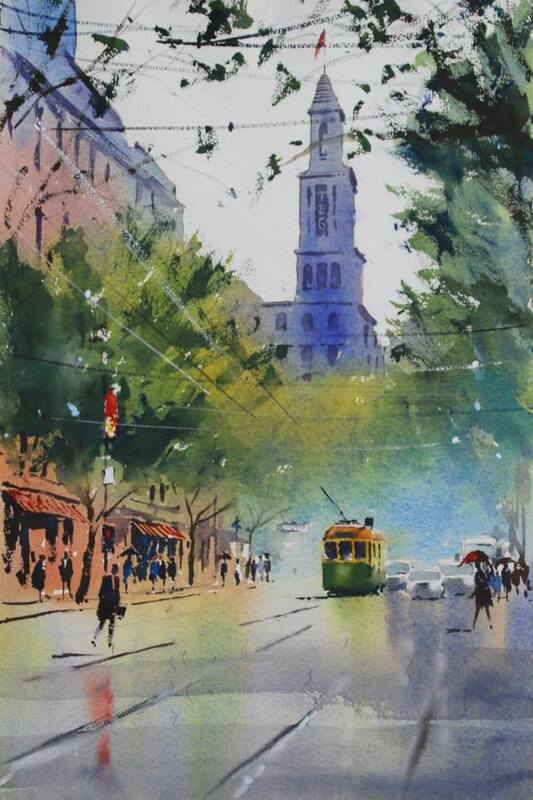 Some of Malcolm’s Urban Landscape watercolours are shown below. They are beautiful, light filled watercolours that tell a story. When I rang Malcolm, he was actually painting an Urban Landscape. Please advise me ASAP of your interest in attending this workshop with Malcolm Beattie. This is still very cheap when you compare 3 days at Dookie at $500 and Grampians Brushes at a similar price for three days. I am really excited about this workshop as it is something that members have expressed an interest when asked for suggestions for watercolour workshops. This workshop is filling fast so if you are interested you need to contact Jen Wallace ASAP. A professional artist, Malcolm places great emphasis on the composition and content of a subject. Combined with sound draftsman ship and an understanding of tonal contrasts and colour, his paintings are both visually interesting and straightforward statements of everyday places and things around him. His paintings depict the life and activity of his environment. His watercolours and oils are characterized by a purity of colour and a straightforward arrangement of tonal values. This emphasizes the light, which, together with a broad approach to detail and careful composition make his paintings stand out from the crowd. Malcolm’s work is represented in corporate and private collections both in Australia and overseas and is available through a number of Melbourne and regional galleries. 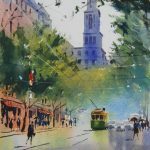 He undertakes regular workshops and demonstrations throughout Australia, and runs a school conducting classes in both watercolour and oil painting technique. He leads painting tours overseas, and, as a regular contributor to the Australian Artist Magazine and International Artist Magazine, his interest in recording his culture and heritage is well known. His first book, Simplifying Complex Scenes in Watercolour, was published in 2003 by International Artist. Born in 1945, Malcolm works and lives with his wife and children in Melbourne, Australia.